Abandoned mining infrastructure in the Copper Corridor, Arizona. © BIO Urban Design LAB – UCL. The BIO-URBAN Design Lab, led by Marco Poletto and Claudia Pasquero – founders of ecoLogicStudio and leaders of the BIO- Urban Design Research Cluster of the MArch Urban Design programme at the Bartlett School of Architecture, UCL – embarked in a research trip to the Sonoran desert in Arizona in March 2014. Arcosanti Foundation, view of the pottery workshop, Arizona. © BIO Urban Design LAB – UCL. 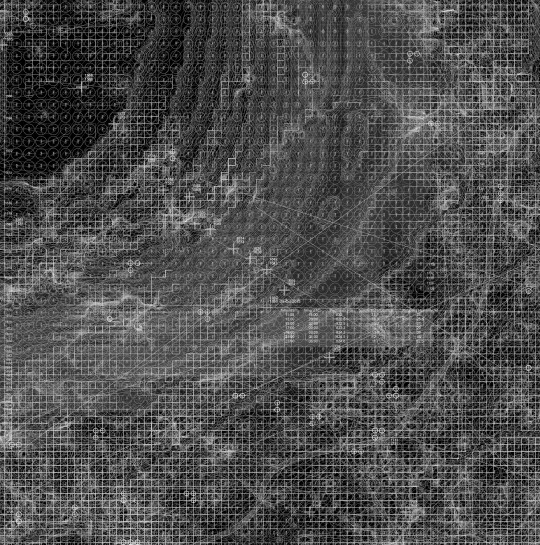 Microclimate morphologies relates to craters: NIDUS team: microclimatic morphologies – projected scenario of emerging biotopes. © BIO Urban Design LAB – UCL. The MArch in Urban Design involves a new generation of practitioners and thinkers engaged in long-term research on urbanisation and design, and is part of B-Pro – the framework of post-professional Masters programmes at the Bartlett directed by Professor Frédéric Migayrou, who explaines that ‘studio inquiry ranges across an expansive set of scales and bodies of knowledge culminating with a design project and thesis. Environmental and ecological questions are prioritised within a critical structure that embraces the dispersed, often paradoxical nature of contemporary urbanism. The curriculum introduces students to various fields such as archaeology, anthropology, ecological history, governance, law, media, philosophy, planning and political theory. Cross-studio dialogue is emphasised, as is a collective work ethic’. Cosanti Foundation – earth cast concrete vault – Scottsdale, Arizona.© BIO Urban Design LAB – UCL. Our mission for the BIO-URBAN Design Lab through our research trip to the Sonoran desert in Arizona was to investigate and problematise the boundaries of contemporary urbanisation, where the natural realm entangles with the man made and produces a multiplicity of hybrid conditions. We chose the Sonoran desert in Arizona following our intuition that it might be the perfect place in which to spot some of the qualities of what we have defined the real-time world city. Biosphere2 – Forest Biome, near Tucson, Arizona. © BIO Urban Design LAB – UCL. The desert is commonly understood as anti-urban. However from our research we observe that precisely because of the remoteness of the desert as a place, it can also become the context where most of the resources vital to the metabolism of contemporary cities are extracted or harvested. It is often where the footprint of the urban meets the natural landscape. Moreover, the peculiar combination of remoteness and infrastructure has facilitated the emergence of unique test beds such as Biosphere 2 near Tucson, where ideas about how we may inhabit and transform new, and perhaps hostile, environments have been pioneered for more than 30 years. 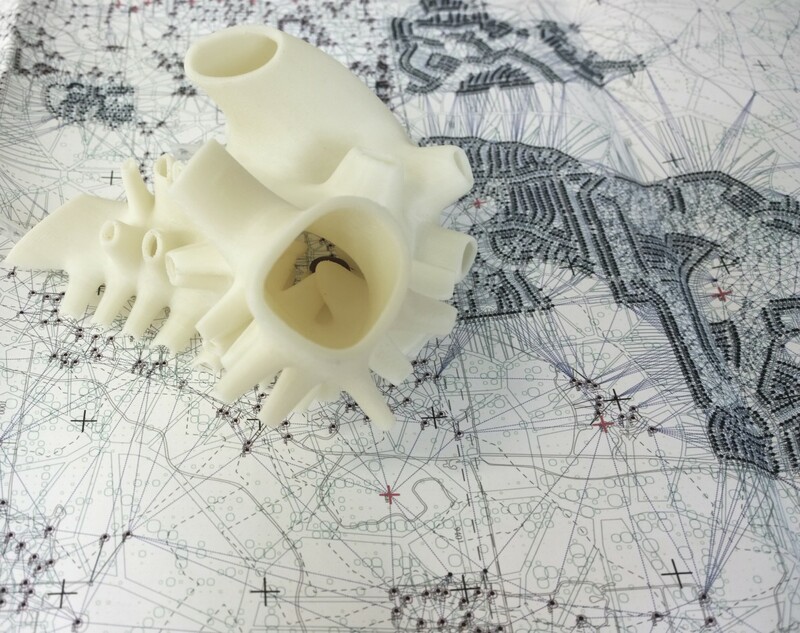 Internet of energy relating to Arcosanti: ZOOX team: Morphologies for distributed energy networks – Urban Protocol linking existing territorial infrastructures to new solar energy morphology. © BIO Urban Design LAB – UCL. Our investigations began at Biosphere 2, now converted into a research centre for the University of Arizona. As we approach the main Biosphere 2 greenhouse, coming from the dormitories on our first morning on the site, the white steel space frame structure piercing through the thick vegetation in the forest biome’, clearly visible, immediately catches our eye. Once upon a time, the forest biome was connected spatially with the ocean and desert biomes, reflecting the continuity found in the real biosphere. These five biomes would, in fact, interact and self-organise, generating multiple transitions zones or bio-tones. According to early theories of biospheric self-organization, allowing such a degree of freedom of differentiation would increase the resilience of the system, and possibly its ability to absorb CO2, produce oxygen, filter water and grow edible food. With its recent conversion into an academic research centre, the biomes are now separated and each one of them serves a specific purpose of research. The original goal of the project was however to test the possibility to create a self-contained space where people would be able to survive in a self- sufficient manner. It was about investigating the possibility to recreate our biosphere inside an enclosed artificial system, possibly supporting the colonisation of outer space. Meteor Crater – agent based model of climatic responsive ground-works, © BIO Urban Design LAB – UCL. Augmented microclimates – morphological model of ground works inspired by collective nest building behaviour of niger ants colonies. © BIO Urban Design LAB – UCL. In this sense we think the original project contains a radical element that the separation has now eliminated. Originally these biomes constituted a continuous and differentiated living habitat able to support plants, animals and human life alike: it was a self-contained techno-garden or what we could call an artificial bio-city. Today we travelled through the Copper Corridor. Its name comes from the fact that it was a valley first colonized in the time of the gold rush and then exploited by mining communities for its copper. A beautiful mountain landscape unfolds around us, where it is easy to spot exposed minerals in the nuances of colours of the rocks, going from green to red and pink. Open pit mines are visible from the road and introduce a level of artificial articulation to the landscape that expose even more colourful geomorphologic effects, often provoked by a combination of planned infrastructural agency and accidental microclimatic influence: rain erosion, solar reflection and so on. Morphologies for distributed energy networks – layers of algal bio-cells proliferate to reach for maximum solar exposure. 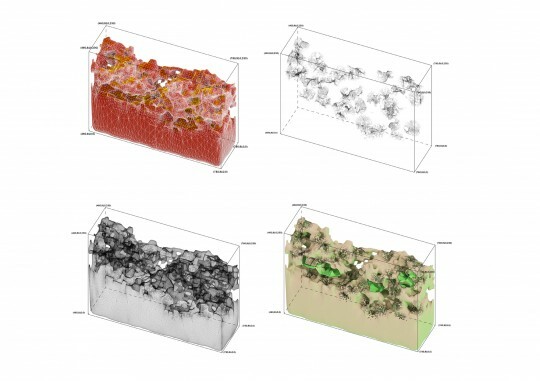 Post-waste city: bio-digital simulation of bio-energy power plant. WP_201407 – post-waste city protocol: urban morphology as function of waste bio-digestion. © BIO Urban Design LAB – UCL. In the immediate aftermath of visiting Biosphere 2, we found it extremely interesting to experience such a unique – manufactured being the operative word – landscape. It made us argue that this kind of manufactured landscape, commonly regarded as a polluting scar in the natural territory, actually possesses its own unique beauty. Like Biosphere 2, it is a third nature, and makes us realize the existence of a form of bio-urban landscape, where rationally planned interventions and naturally occurring phenomena like rainfall, erosion, biological growth act upon each other mutually and unintentionally. We can then speculate on how, in the future, the mechanical transformation of the landscape related to its planned exploitation, maybe continuously counteracted by a bio-digital protocol able to synthetically re-engineer it into a generative terrain, an inhabitable bio-city. 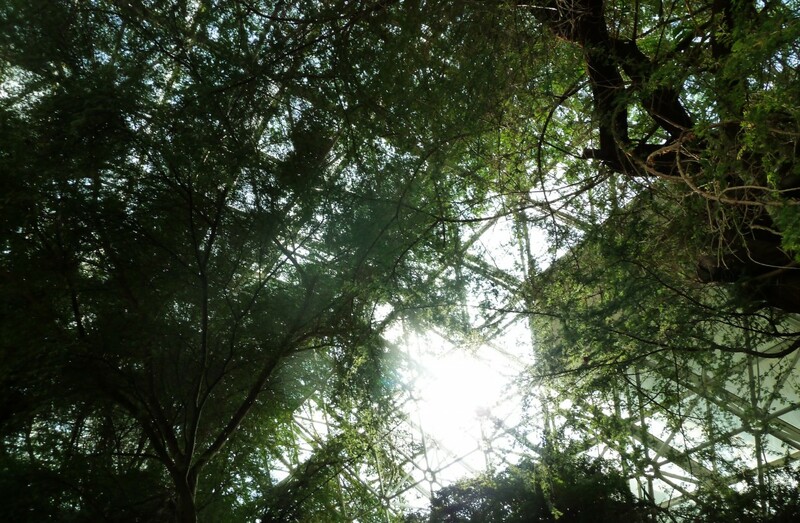 Relating our contemporary bio-digital technologies to what the designers of Biosphere 2 attempted to do within their enclosed greenhouses, we may ask ourselves: is it possible to plan for uncertainties? Can we combine in a mutually sustaining way protocols for the optimized extraction of resources with those of non-linear breeding of new bio-digital ecosystems? 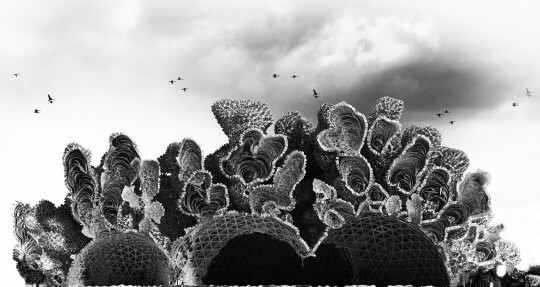 Cities from waste – wet model, 3D printed substratum, organic waste, mycelium, agar.© BIO Urban Design LAB – UCL. Heading north beyond Flagstaff we reach a high plateau pierced by a multitude of craters. Some of these constitute another kind of artificial landscape – this time the product of falling meteorites. These craters are also another type of nature, like something alien to our biosphere but not created mechanically. Their morphology is peculiar and it creates a microclimatic phenomenon of thermal inversion which scientists have been studying with both digital simulations and real-time sensing. 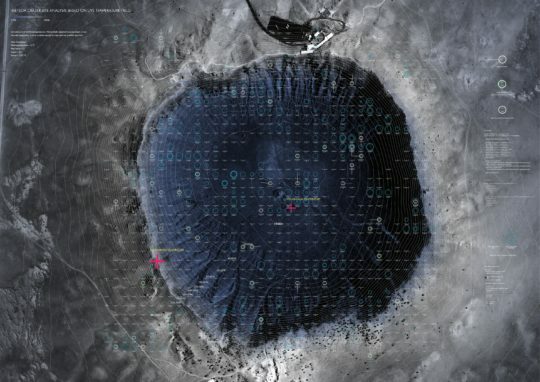 They discovered that the steep walls of the crater, combined with the thin air and powerful sun of the local microclimate, generate peculiar convective flows which in turn affect the local temperature from one side to the other of the crater. Such phenomena may well apply to the large open pit mines in the copper corridor. It could be interesting to re-conceive the central pit of the open mines as an alien microclimate. This suggests a novel microclimate which could breed unknown bio-topes differentiating into a multiplicity of bio-tones with fuzzy edges. 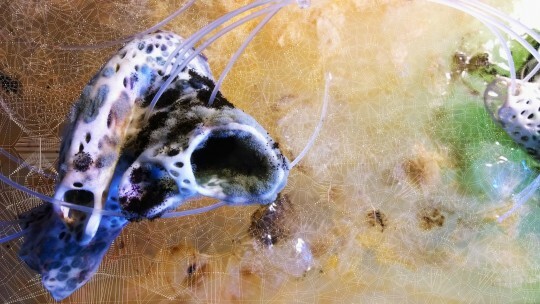 Perhaps we can think of augmenting and bio-engineering these emergent ecologies to articulate them into thousands or perhaps millions of interconnected micro-habitats, each of them co-evolving specific types of life forms, the future bio-cities. We are now travelling back to Scottsdale, west of Phoenix, to the Cosanti Foundation. This was where Paolo Soleri, an Italian architect from Turin who emigrated to the US to study in the early 1960s, created his first studio and experimental laboratory from 1970, just after he left the nearby Taliesin West, where he spent two years working with the internationally renowned modernist maestro Frank Lloyd Wright. Arcosanti, Arizona, © Arcosanti Foundation. While working in Taliesin Paolo developed his early architectural and urban ideas as well as a distinct interest in the model of the atelier, or what we now would call a prototyping lab. Here in Cosanti, Paolo developed a series of fabrication techniques to construct small pavilions. The best known one is the earth casting technique which utilises piles of soil as decorated formwork for casting concrete vaults. All the pavilions were developed collaboratively and with students coming from the University of Arizona to work with him. Here in their raw state they constitute a beautiful example of design research, and in particular of a radical approach to material experimentation; one that is not confined to the scale of the prototype itself but is able to become a sort of proxy model of something much larger, assisting the development of material protocols for a production of a new urban model. This would later be known as Arcosanti. These experiments clearly reveal where some of the ideas later found in Arcosanti actually come from. You can see how these experiments – very much material and technological in nature – later became fundamental ideas that got translated within his urban vision. This was literally a trans-disciplinary and trans-scalar project which started from material experimentation and ended in the urban philosophy of frugality. 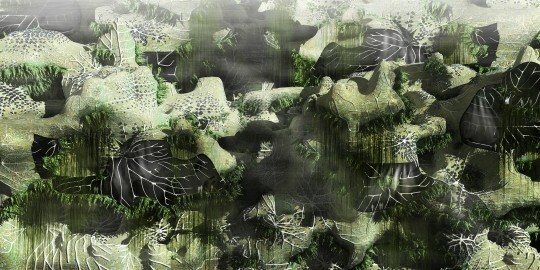 Post-waste city: bio-digital simulation of bio-energy power plant. Arcosanti, the test bed for Paolo Soleri’s eco-social urban visions, is really about urban density, or perhaps better intensity. Soleri felt very strongly about the social and ecological troubles caused by sprawling urban development, particularly in the United States and clearly visible here in the desert of Arizona around the cities of Phoenix and Tucson. Arcosanti became a sort of eco-socio-technological test bed designed to bring people together and to enable our society to evolve increasing levels of cooperation and exchange while breaking the isolation brought about by suburban living. 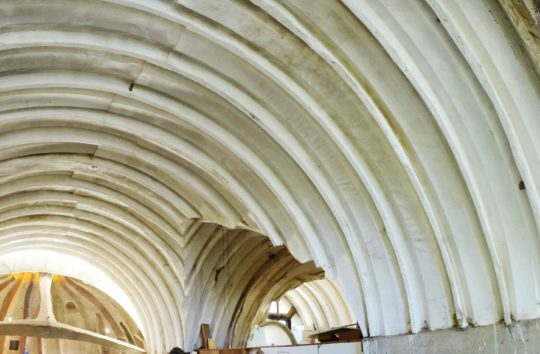 In this sense the project of Arcosanti goes beyond the idea of density as an urban tool and opens up to a whole new philosophy and form of holistic approach in which the use of resources, the interaction between people and the collaboration or co-evolution between different systems, is at the core of the project. We visited Paolo’s archive and discovered incredible drawings that portrayed cities built into dams or into bridges or other kinds of infrastructure. We discovered roofs becoming auditoria and covering houses which in turns shaded working or public spaces. The word frugal was frequently used. However it didn’t have the traditional connotation of the Franciscan sparing of all pleasures. What it really meant was the ability for one system to solve not one but multiple purposes, to negotiate multiple necessities, to co-evolve within a network of multiple relationships. This idea of co-evolution is probably the strongest one here in Arcosanti both architecturally, then philosophically, and it was so clearly exposed to us by Suzy, the archival coordinator, who has been meticulously taking care and organizing the archive of all Soleri’s work. We began our trip in Biosphere 2 and ended it in Arcosanti. These are two projects that, despite their radical differences, somehow seem to share fundamental principles. They place man right inside nature as co-evolving systems, in ways that cannot be disconnected; they both somehow seem to claim that our urban society is a co-evolving natural system. In a radical way they seem to assert that nature actually does not exist, at least as an untamed ethical reference. Nature is a co-evolved system with the human one, and since the human system, our technological apparatus has evolved to the point of having such a big impact on the natural systems, it has become impossible to distinguish the two. Both projects do not concern themselves with vague notions of conservation of the natural environment, but go beyond that to test and problematise the limits this notion of artificial nature. Each attempts to materially test the limits of our role within this co-evolving system, which have been explored formally, materially and technologically through the research proposals the BIO-Urban Design Lab has developed this year: notions of waste, pollution, renewable energy and urban microclimate were challenged to became the raw material for the synthesis of new urban protocols and related morphologies. Together with further research into biomimetic models of collective intelligence, the Lab was able to develop digital codes to simulate scenarios of developments that are adaptive and co-evolutionary, and redefine the common framework of our understanding of urban ecology. Post-waste city: bio-digital simulation of bio-energy power plant – post-waste city protocol: urban morphology as function of waste bio-digestion. © BIO Urban Design LAB – UCL. Marco Poletto is an architect, author and educator. After graduating with Honours from Turin Polytechnic in Italy he moved to London to study at the Architectural Association. He worked in the city as an environmental designer with Battle McCarthy before co-founding ecoLogicStudio in 2006. Marco has lectured and taught internationally and as been Unit Master at the AA in London from 2007-12 and Visiting Lecturer at the IAAC, Barcelona, and Cornell University, Ithaca. He is co-author with Claudia Pasquero of Systemic Architecture: operating manual for the self-organising city by Routledge. He now leads the BIO-Urban Design Research Cluster at the Bartlett, UCL. Claudia Pasquero is an architect, engineer, author and educator. She worked in London as architect for international offices such as Ushida Findlay Partnership and ErickVan Egeraat Architects before co-founding ecoLogicStudio in 2006 with Marco Poletto. Claudia has completed a public library in Cirie’ (Turin) among other projects and has exhibited ecoLogicStudio’s work at the Venice Architectural Biennale in 2006, 2008 and 2010, with different interacting prototypes investigating the boundaries between architecture, science and tradition. She has lectured and taught internationally, and has been Unit Master at the AA in London from September 2007-September 2012; Visiting Lecturer at the IAAC, Barcelona since 2006; Hans and Roger Strauch Visiting Critic in Cornell University, Ithaca, NY in 2011/2012; director of CyberGardening the City AA, Milan, from September 2010; Director of Digital Fabrication: Fabrication Ecologies at the IAAC in Barcelona since October 2012 and Unit Master for the Graduate School in Urban Design at the Bartlett, UCL London since October 2012 where she is MArch II Urban Design Stream Leader and with Poletto, leader of the BIO UDII Research Cluster.